In a large sauté pan, heat the olive oil over medium heat. When the oil is hot, add the diced potato, minced shallot and a few pinches of salt and pepper. Give it a good stir and cover the pan; cook the potatoes for about 5 to 10 minutes until the potatoes are very al dente. Note: be sure to mix the potatoes every so often to prevent them from sticking to the bottom of the pan. Mix in the minced garlic and crumbled chorizo and cook for an additional few minutes. Next, add the kernels of corn and cook for 2 to 3 minutes more. 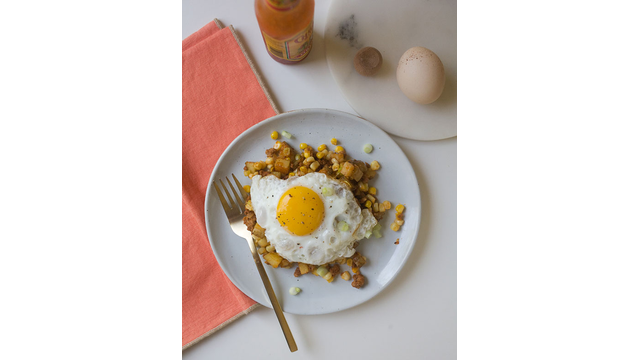 Sprinkle in the sweet paprika and add the green onion; give the entire hash a good toss. Adjust the salt, pepper or any other seasoning to your liking. Also, make sure to taste a piece of potato to make sure it's completely cooked. Turn off the heat and cover the pan while you fry up the eggs.